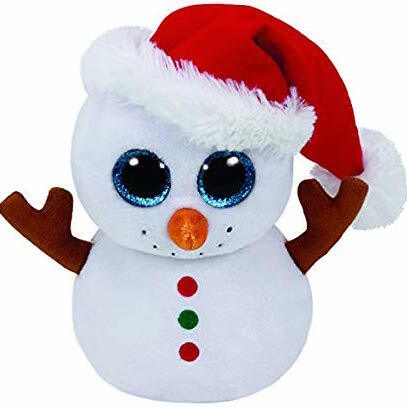 Scoop is a white snowman with large, glittery blue button eyes and a shiny orange “carrot” nose. His arms are brown sticks and he has two embroidered red buttons and one green button on his belly. He wears a red Christmas hat with a white fluffy trim and white pom pom hanging from the tip. And I love playing outside when it’s real cold. Scoop was released on 1st July 2016. His Birthday is on 5th January. There are two versions of Scoop. This small 6″ Beanie Boo and a medium 9″ Beanie Boo Buddy. He was retired on 21st February 2018.